Checking it out: Two hotel employees looking at the proposed River of Life masterplan displayed for the 11 precincts. A 110km stretch of the Klang River will be cleaned to improve the water quality by the year 2020 under the River of Life (ROL) beautification project. 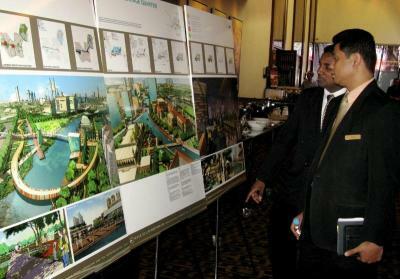 The project is aimed at transforming the Klang and Gombak River into a vibrant and liveable waterfront and to increase the economic viability of the area. It is one of the five Entry Point Projects (EPP) for the Greater Kuala Lumpur/Klang Valley under the Economic Transformation Programme (ETP). A master-planning and beautification work will be carried out in 11 precincts within a 10.7km stretch along the Klang and Gombak river corridor. The first phase of the project along the Klang River is near Dataran Merdeka, the Sultan Abdul Samad Building, Central Market, Chinatown and Masjid Jamek. Kuala Lumpur mayor Tan Sri Ahmad Fuad Ismail said Aecom, a consultant appointed by City Hall (DBKL), was drafting the ROL masterplan and would engage with stakeholders to gather insight and views to ensure the relevance and sustainability of the project. The participation of the stakeholders in the early planning stage was important to ensure the success of the ROL masterplan, he said at a one-day workshop held at a hotel recently. Ahmad Fuad added that Aecom, which was appointed on Jan 5, has been tasked to prepare the masterplan within the next six months. The workshop is the second in preparing the masterplan. The first workshop was held on Jan 5 and 6. ·Seek views and ideas of all stakeholders to help the consultant prepare a comprehensive masterplan and take into account the views of all parties. “This workshop also aims to foster a healthy partnership between the Government and the people to plan and prepare a masterplan for the beautification and development of our rivers,” he said. Ahmad Fuad said the Government was working to propel economic development towards a high-income country through the National Key Economic Areas (NKEA) and to position the Greater Kuala Lumpur/Klang Valley among the top 20 liveable cities in the world by the year 2020. He said within the ROL, there were three main components — cleaning of the river, beautification and development. As a result of this, it is expected to trigger an indirect economic investment to the land along the river. “These parcels of land will be identified and will be offered for development soon,’’ he added. Ahamd Fuad said to ensure the success of the ROL, several key initiatives needed to be improved such as upgrading existing sewerage facilities, expanding regional sewerage treatment plants, installation of waste water treatment plants at five wet markets, installation of additional gross pollutant traps to improve water quality and relocation of squatters. 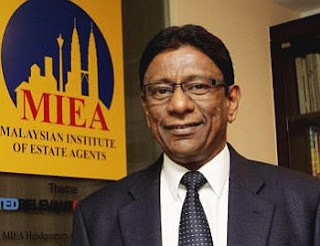 PETALING JAYA: The Malaysian Institute of Estate Agents (MIEA) expects a slowdown in the high-end residential property sub-sector this year as potential buyers are likely to maintain a cautious approach in light of the economic uncertainties in Europe and the United States. Natural progression: Paul says that rising property prices in Malaysia has forced many people to buy homes further away from the city. “There is a lot of caution now due to the uncertainty in Europe and the United States. With fear of a potential spillover effect, most buyers are adopting a wait-and-see' approach,” said MIEA president Nixon Paul. Paul said the various “checks and balances” by Bank Negara to control the increase in household debt would also affect residential property transactions. Starting this year, banks have been using net income instead of gross income to calculate the debt service ratio for loans. According to reports, this is a pre-emptive move by Bank Negara to contain the rise in consumer debts. The guidelines cover housing, personal and car loans, credit cards, receivables and loans for the purchase of securities. The MIEA is the authorised body representing all registered estate agents in Malaysia. Paul said there was an over-supply of condominium units in the country and that rental rates for such units could be affected. Despite this, he said, it would be a good time now to invest in the high-rise market for long-term investors. “We are one of the cheapest in the region and if you are looking to invest over the long term, say 10 years, now is a good time to get into the condominium market. Over the next decade, prices will appreciate. Paul noted that rising property prices in Malaysia had forced many people to buy homes further away from the city. “I do feel sorry for the average guy, but if you look anywhere else in the world, it's a natural progression. Those who can't afford it live further away from the city. Paul said one of the main issues facing residential property transactions today was the big disparity between the intended property price and valuation price. “A buyer and seller might agree on a particular price but the valuation might not be the same. When that happens, the loan application procedure becomes a problem and the deal ends up getting aborted,” he said. Separately, Paul said the commercial property sub-sector would be buoyant this year. “It's going to be a buzz! Most investors are shifting to commercial from residential because they feel this sub-sector is more resilient, especially in a downturn,” he said, adding that there was pent-up demand for commercial property in Malaysia. Paul said the office sub-sector might face a slowdown due to oversupply in space. “There is an oversupply of office space. Rentals in prime locations such as KLCC may not be affected but not those located in the outskirts of the city,” he said, adding that major shopping complexes, especially within Kuala Lumpur, would continue to experience good take-up this year. “It's still the safest place to put your money in. These days, a lot of people are shifting their investments into property. You can hedge yourself well against inflation when you invest in property,” he said. PETALING JAYA: IOI Corp Bhd is mulling a relisting of its property arm that would see the group unlock values in that segment and enhance the attractiveness of the parent company to investors as a more plantation-focused company, according to reliable sources. “The group is in discussion with two investment banks on this to get feedback, especially on the right timing of the exercise,” said a source. Analysts said the relisting of its property division would increase the stature of IOI Corp as a pure plantation play which would likely have higher valuations. “It will reduce the conglomerate discount and transform IOI Corp into a pure plantation play, with a controlling stake in a valuable property company IOI Properties. Sole industry companies usually tend to fetch higher valuations,” an analyst with a local bank-backed research house said. IOI Corp may wish to also time the relisting of its property arm in line with a more bullish view on the property sector. IOI Corp had privatised its arm in 2009. Then known as IOI Properties Bhd, IOI Corp had on Februuary 2009 launched a takeover offer at RM2.60 per share. The takeover was successful and IOI Properties was subsequently delisted on April 28, 2009. It is today wholly-owned by IOI Corp. IOI Corp has been actively growing its property business since. In January it acquired six acres of land in Singapore for RM995.5mil to build high-end condominums and will have to settle the entire amount to the government of Singapore within 90 days from the date of the tender acceptance letter. Presently, it has seven projects which it is developing locally with estimated gross development values (GDVs) of almost RM20bil. Properties can testify to its track record in building property projects that have sold well. Excluding the latest land buy in Singapore, it is also presently developing high-end projects in the southern neighbouring island state with GDVs close to RM6bil. IOI Properties has completed property development projects in Puchong, Putrajaya, southern Johor and Singapore before. Meanwhile, banking sources also said that IOI Corp was in talks with banks to raise more funds. “It is in a good position to do so, considering its huge cash flows from its plantation side of the business,” said one banker. The funds raised should give IOI Corp sufficient funds to not only pay for the Singapore land acquisition but also ready funds in the event it chooses to buy more assets such as plantation land. Based on its results for the first quarter ended Sept 30, 2011, IOI Corp had total short and long-term borrowings of RM688.24mil and RM4.87bil respectively. Most of these debts are denominated in the US dollar, the Singapore dollar and the yen. IOI Corp had cash and cash equivalents of RM3.22bil as at Sept 30, 2011.